The cushions are handmade by Alicia and Cheryl Rossman. 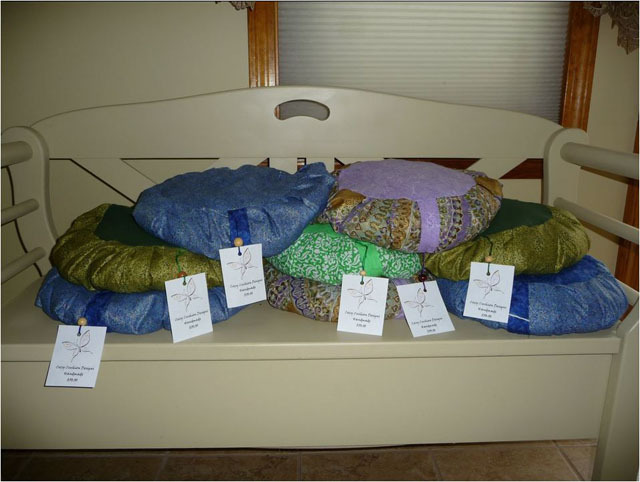 Each cushion is stuffed with 4 pounds of buckwheat hulls and sewn with love. If you are interested in practicing yoga or meditation these cushions are for you! Don’t let your focus take a detour because of a sore fanny! The cushions help to establish a comfortable sitting position to protect the alignment of the spine and maintain a good posture during your meditation and yoga practice. The cushion can be adjusted for any body as the hulls move with your shape. Most people cut their meditation session short because it’s uncomfortable. To encourage yourself, why not enhance comfort level with a Cozy Cushion.